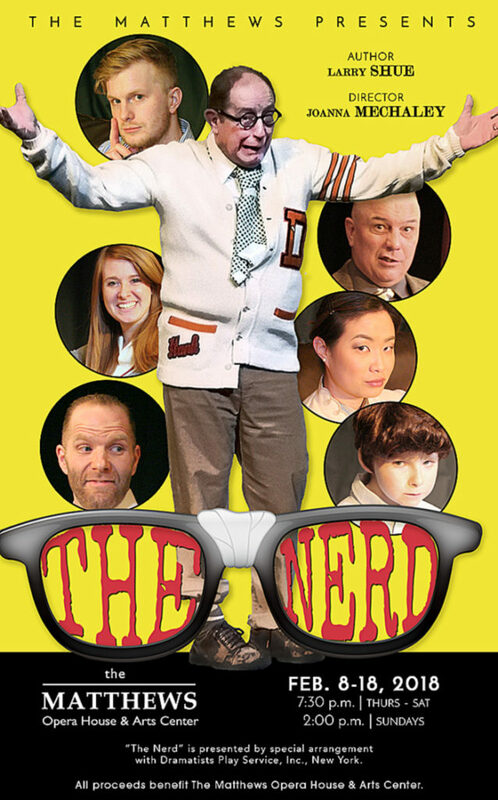 The Matthews’ community theater presents the comedy, “The Nerd,” written by Larry Shue. The event runs Thursday through Sunday, Feb. 8-11, 2018. “The Nerd” is directed by Joanna Mechaley. The Thursday-Saturday performances start at 7:30 p.m., while the Sunday performance is at 2 p.m.
One of the funniest plays ever written, this extraordinarily inventive comedy was first presented by the Milwaukee Repertory Theatre in 1981, then produced in Great Britain, then went on to Broadway. Larry Shue, the author, was already known for his comedy “The Foreigner,” but his promising career as an American playwright was cut short when he died in a commuter airplane crash at the age of 39. 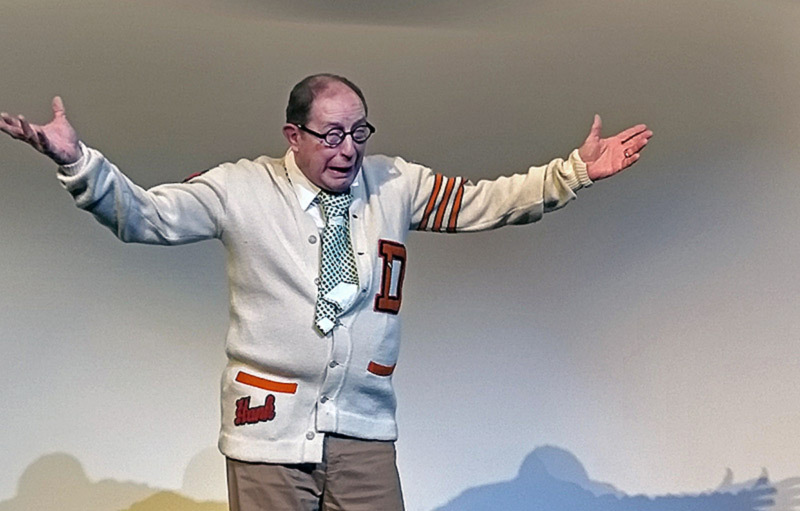 He left behind a small body of published work as well as two side-splitting comedies, “The Foreigner” and “The Nerd,” which continue to be a staple in community theater. Don’t ask. Just get your tickets! Willum is delighted when Rick shows up unexpectedly at his apartment on the night of his 34th birthday party. His delight soon fades as it becomes apparent that Rick is a hopeless “nerd”—a bumbling oaf with no social sense, little intelligence, and less tact. Rick stays on and on, his continued presence among Willum and his friends leading to one uproarious incident after another, until the normally placid Willum finds himself contemplating violence—a dire development which, happily, is staved off by the surprising “twist” ending of the play. wiping away tears of merriment…” —Variety. 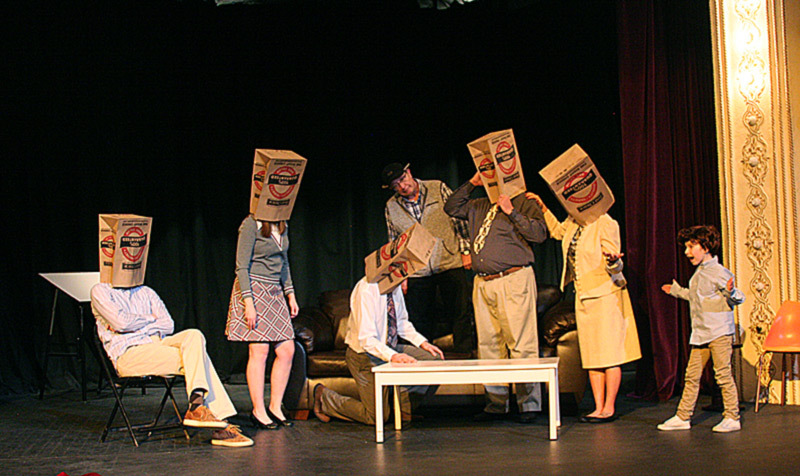 “…a spring tonic of side-bruising laughter…” —The Milwaukee Tribune. “The Nerd” play program. Click to view or download. Are you a Season Subscriber? Get a Discount! Well, aren’t you smart? A benefit of buying a Subscription Series ticket this season is getting a $5 discount on the adult ticket to this show. Whether you buy your ticket online or through our box office, your adult ticket will be discounted automatically. Cool, right? KEVN Black Hills, South Dakota Arts Council, Great Western Bank, Killian’s Tavern, Black Hills Pioneer, Century 21, City of Spearfish, DeSmet and Biggs, LLP, Forcoli & Sons Painting, Wolff’s Plumbing & Heating, Inc., Lucky’s 13 Pub, Spearfish Holiday Inn, The Apple Blossom, Zonta Club of Spearfish, Optimist Club of Spearfish, The Matthews’ family, The Kelley family — CLICK HERE to visit these sponsors’ business websites. This entry was posted	on Friday, March 10th, 2017 at 4:48 pm	and is filed under News & Blog, Past Community Theater Shows. You can follow any responses to this entry through the RSS 2.0 feed. Both comments and pings are currently closed.